Read about "The Long Island Hot Tubs Story"
Real Stories. Real People. Real money. StrikingItRich.com is not about the well-known e-commerce giants, but something far more unusual and useful: 23 sites that have learned to do almost everything right. Each one has practical and fresh ideas to share -- insider information that will nourish your e-commerce ambitions whether you are a budding entrepreneur or Fortune 500 executive. You'll also read about offline retailers with a catalog or store who leveraged their business to the Web, some of whom have now added millions of dollars to their bottom line. Furthermore, I focused on the online entrepreneurs facing the biggest challenges. None of the sites profiled sell computer merchandise or offer computer-related information. Ditto for adult material. These propositions are much too easy. Selling $150 hard drives on the Net is a snap compared to a $975 panel saw (refer to Coastal Tool and Supply, profile 3). What is common to all is that they were started by ordinary folks with big dreams and modest budgets. I have delved deep inside these 23 entrepreneurial minds getting answers to all your questions, candidly revealing exactly what works and what doesn't. Told in story form, there's never been such a wealth of down-to-earth, fun-to-read business information. Best of all, you can read constant updates on all 23 profiled sites along with additional success tips right here at the StrikingItRich.com website. Jaclyn Easton Jaclyn Easton spends more time online than most people do sleeping. Of course this makes sense for one of the nation's top Internet experts. 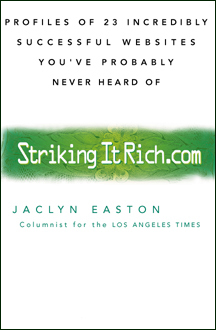 Specializing in e-commerce, Jaclyn has established a devoted following as a columnist for the Los Angeles Times, on-camera Internet expert for CBS 2 News in Los Angeles and host of national radio show, LOG ON USA. As the voice of LOG ON USA, Jaclyn knows how to succinctly and effectively talk about e-commerce to a general audience... from people just getting started to Fortune 500 executives. Because of this unique talent, Jaclyn's show is in its fifth year and is syndicated nationally to 60 cities (that's 15 more cities than Howard Stern).